Partner: I know; it's just too much. I don't how how much longer I can keep doing this. Me: Well, if you seriously decide to leave, let me know, because I'm right behind you. Partner: Right, there's no way I'm doing this job without you. And, then, somehow we dig in and keep working. We work hard. We put in long hours. The begining of the year is rough for a lot of teachers, but I have found the Newcomer Center to be particularly challenging. The kids are SO new, and have so much to learn- both language and our systems and routines. And, behavior! Kids come from situations where they had to be physically aggressive to survive and it takes time and patience to teach them a new way of interacting. We have endless discussions about how to make things better. We change things. We tweak systems and routines. We talk to them, encourage them, get firm with them. We analyze different students and come up with strategies and things to say to them that we think might help. We reflect on our successes and our failures. We cry some days and we laugh every day. We take turns being discouraged and burned out. And, then little by little, things start to get better. They get used to routines. They start to respond better. They learn some English, which helps. They start to feel comfortable and safe, which helps even more. They see that we are on their side, which helps the most. And, our little community of the Newcomer Center starts to gel. And, we look at each other cautiously and say, "I think it's getting better. Maybe I won't quit this year." Oh, make no mistake, it's far from perfect, and there are still some pretty difficult days. But there are more good days than bad days. And, we remember that difficult and challenging is not the same as "bad". Like at the end of October when the whole class throws me a surprise belated birthday party. My birthday is in August, just for the record. Last year they gave my partner a big party in the spring for her birthday. When it was over, they asked me when my birthday is and were disappointed when I told them that it was in the summer and we wouldn't be together. Some of the girls from last year started plotting this fall about a "belated" party and soon they were planning and scheming. 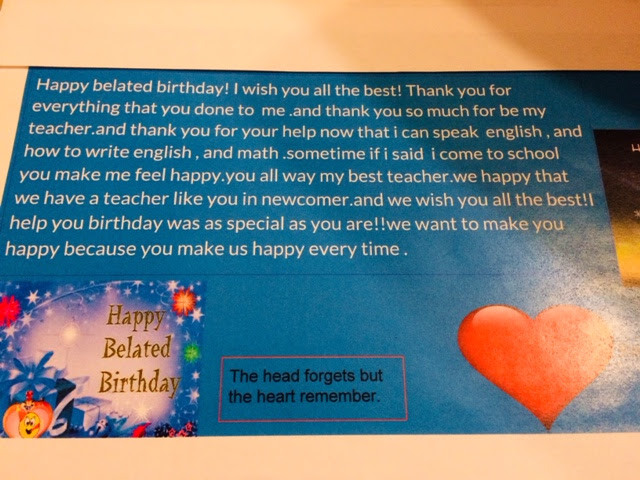 They went to a lot of trouble with decorations, food, and heart-felt cards.They made speeches to me about what I mean to them that left me in tears. Much to my dismay, they also gave me a lot of presents, which I felt equally moved and humbled by. The majority of these families don't have much and the thought that their parents spent some of their limited resources on a gift for me leaves me speechless. Also, I was not surprised at all. They were not good at keeping it a secret-at all. 2. Seeing their wonder, joy, and excitement in learning. One of the reasons I love working with these kids is that most of them are really open and excited about learning. They are still experiencing a sense of joy about new things. Maybe because many fled war and spent time in refugee camps, they have a deep appreciation for education. If you go without something for a while, you don't take it for granted. Many of these kids complain when the weekend comes and whine a lot when there's a longer break. They simply love school. They can't get enough. We went to the local nature center on Tuesday for a field trip and a lesson about birds. They got to trap, study, and release birds. I spent most of my time watching them watch birds. I loved seeing their unbridled, unashamed enthusiasm. They were so excited, so engaged, so alive with curiousity and awe! Those are the teaching moments I live for, and they really do sustain me. Last week, my partner and I had an early morning meeting so we weren't in our room to greet the kids as they arrived for the day. Our paraprofessional was there to supervise them and let them know that we were in the school, just at a meeting, and would be back in time for class. We walked into class, maybe 2 mintues late. They started to clap. I am not kidding. They broke out into spontaneous applause - I guess so happy to see us. And, so, for all of these reasons and more, we decide to stay. Not to quit any time soon. There are still plenty of challenges and many difficult days, but there has been a shift in the right direction. And the shift is lovely and important. It's important to note that this shift just didn't come out of nowhere. It came from two teachers putting everything into these kids, refusing to give up, and keeping our hearts open.